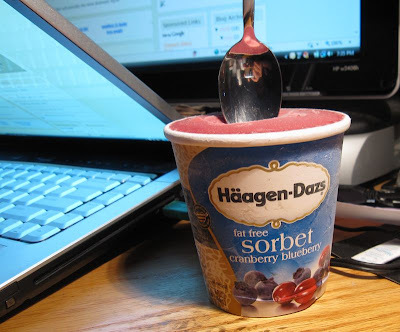 I'm having this pint of Haagen-Dazs Cranberry Blueberry Sorbet. I've been migrating over to the sorbets lately, mostly because it's fat-free. It seems I'm still a junk food junkie, but one that's put focus on slimming down. Anyways, last month I said I was eating a pint of Ben & Jerry's "Berried Treasure" sorbet, which is comparable to this in that theirs has Blueberry & Blackberry swrils in a lemon-sorbet base. This Haagen-Dazs, on the other hand, still uses lemon, and as a result has the same tanginess as the Ben & Jerry's. The difference is that the cranberry & blueberry are blended into the lemon, and not swirled. The result is an even taste all throughout the pint. Well. I think I prefer the Ben & Jerry's. I mean, both brands effectively have the same lemon tanginess with the berry flavors, except the Ben & Jerry's, by using swirled berries, tends to provide some flavor variation. That is. sometimes you get mostly lemon, sometimes you get mostly berries, sometimes both. The Haagen-Dazs is still yummy, but if I had to be stuck on a tiny island in the middle of the Pacific, and could only choose between one brand, I'd go for the "Berried Treasure", and no pun intended. 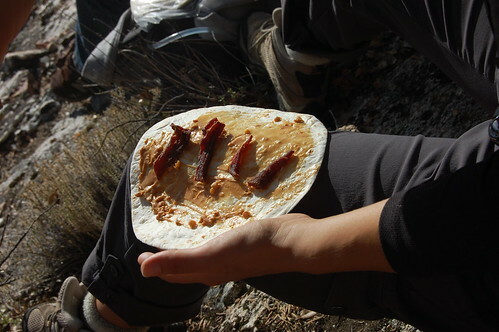 PB&J = Peanut butter & jerkey, originally uploaded by xcdave. It seems lately the quesadilla has become my favorite method of consuming leftovers. I'll take whatever leftovers we have in the fridge, and dump it into a cheese-filled tortilla, and then nuke it for 1 minute. It helps to dab some Cholula sauce in there too. In this case, we had a box of onion rings from Lucille's Smokehouse Bar-B-Que. It's a chain of restaurants in California, Arizona, and Nevada. They have these thinly sliced onion rings, made from red onions, as appetizers. It's comparable to the "Bloomin' Onion" that you get at Outback Steakhouse and other steak joints. Except after I took the photo, I added another layer of cheese. Then I nuked it for 1 minute. Truthfully, I really didn't know how this was going to taste. I think I put too much cheese on it, because I taste more of the cheese than anything else. And the Cholula sauce was "ok". It would have been better to use BBQ sauce. This would have actually been better with some thin sliced steak. 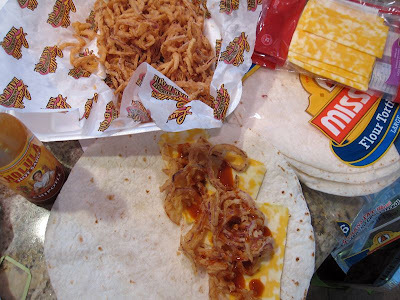 So what do you junkfoodies think about the quesadilla as a vehicle for consuming leftovers?